Following my deconstruction of Einstein’s “spooky action at a distance” a couple of weeks ago, I thought I’d have a go at another hackneyed quote from the world of physics. 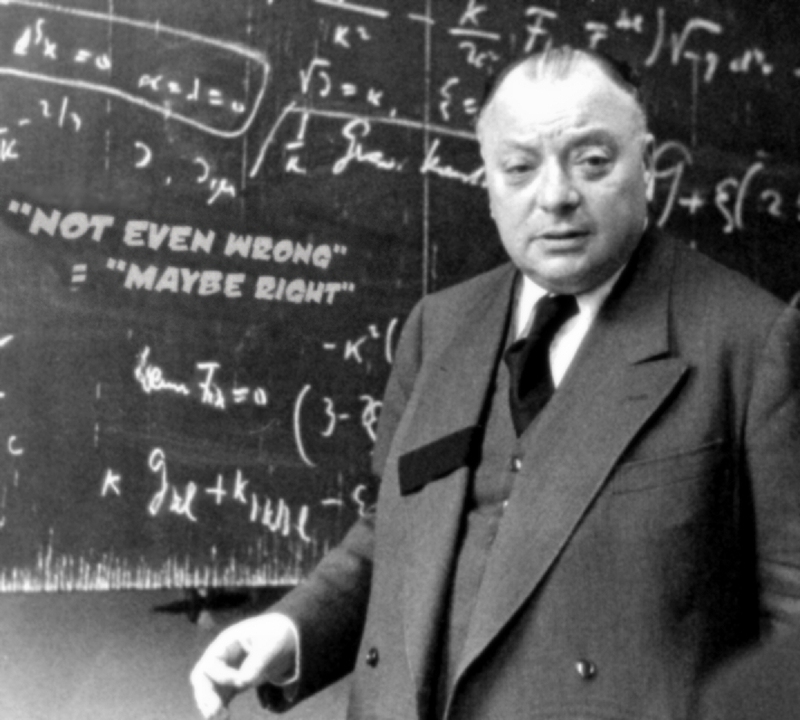 “Not even wrong” was coined by Wolfgang Pauli in the 1950s, and it’s widely used by scientists to describe theories that are fundamentally non-scientific. The phrase may sound like a contradiction in terms, but actually it has a precise and literal meaning. I still get annoyed when people use it, though. That’s not because it’s used incorrectly, but because the people who use it think it means “worse than wrong”, which it doesn’t. Even Pauli himself seems to have used the phrase as a pejorative (the correct equation was photoshopped onto the blackboard by me, as if you hadn’t guessed). There is no such thing as “worse than wrong”. Right and wrong are extremes, and anything that is not right, and not wrong, must lie somewhere in the indeterminate region between the two extremes. A theory that is “not even wrong” is one that is permanently stuck in a state of indeterminacy. There is simply no way of telling whether it's right or wrong. When the scientific method was first developed in the 16th and 17th centuries, it was understood that it was applicable only to a subset of human experience – namely to phenomena that take place in the physical world. The kind of aggressive, materialistic atheism associated with science today was virtually unknown in those days. Even the greatest scientists accepted that the physical world—and hence the applicability of the scientific method—was only part of the sum total of human experience. In those days the distinction was between “earth” and “heaven”, although today we are more likely to say “physics” and “metaphysics”. The physical world is the realm of experiment and objective analysis. The metaphysical world is the realm of belief and subjective experience. Materialistic scientists, from Wolfgang Pauli to Richard Dawkins, are perfectly entitled to hold the belief that the metaphysical world is non-existent. That belief is as valid as any other. What they aren’t entitled to do—and yet they insist on doing—is to attempt to disprove metaphysical theories through the application of the scientific method. You simply can’t do that. 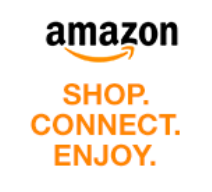 You can’t apply a tool that was specifically designed for the physical world to something that is non-physical. One of the fundamental principles of the scientific method is the idea of the testable hypothesis. This is a brilliant concept when it’s taken in its proper context. The defining characteristic of the physical world is that it’s amenable to repeatable experiments. For a hypothesis to be “scientific” it needs to make predictions that can be tested by experiment. If the results of the experiment agree with the predictions, then the hypothesis may be right. If they disagree, then it must be wrong. By definition, any meaningful hypothesis about the physical world must be testable. Equally by definition, hypotheses about metaphysics aren’t going to be testable. Metaphysics is all about belief and subjectivity. It encompasses everything within the scope of human experience that isn’t part of the physical world. So a metaphysical hypothesis can’t be proved right, and it can’t be proved wrong. It may be right, and it may be wrong – it’s a matter of individual belief. That’s what people are referring to when they say “not even wrong”. What I object to is the fallacious assumption that a non-testable hypothesis, on a metaphysical subject, is wrong by definition. It isn't. It’s indeterminate – it can never be proved one way or the other. If someone chooses to believe in such a hypothesis, then you’re free to disagree with them. But you can’t disprove their theory, and it’s a mistake to think you can. The error comes about from half-understanding something that everyone is taught in university science classes. You’re taught that a scientific theory, about the physical world, is badly formulated if it isn’t testable. That’s true. But it doesn’t mean that a non-scientific theory, about the metaphysical world, has to be testable. In fact the opposite is true, because if it was testable then it wouldn’t be metaphysics. The fault doesn't lie entirely with the scientists. There's a growing tendency for metaphysical theories to be presented as if they were scientific, in a misguided attempt to give them more weight. It’s perfectly valid to use the non-testable, “not even wrong” criterion to demonstrate that such theories are non-scientific. But that's as far as you can go. You can't say “also the theory is wrong”... the most you can say is “also I don’t believe your theory”. It bothers me to hear people say "choose to believe." If you choose to believe something, you don't really - and I think that's a huge problem. We believe things because we become convinced of them. This can happen by intellectual or emotional processes, by direct experience, by reason, by any number of ways. I know a lot of people who profess certain beliefs and defend those beliefs rabidly - by shouting so they can't hear arguments against it and sticking their fingers in their ears so as not to be seduced away by evidence or arguments that might convince them the belief is not so. They talk loudly about faith, but they don't have enough faith in their chosen system to examine it. Mostly they seem afraid to believe anything else. These beliefs are not beliefs; they are self-deceptions. And that never leads anywhere good. I hadn't thought about it before, but "choose to believe" is something most people would only ever say about someone else, not about themselves. Traditionally, people believe what they've been conditioned since childhood to believe, and don't even realize the belief is optional. The obvious exception is the New Agers, who consciously mix-and-match beliefs so they can tailor them to their exact choosing. I devised a handy web app along these lines several years ago - Create Your Own Religious Movement. But I didn't really want to get into any of that in this particular post. I was just making a distinction between the physical world (e.g. the Second Law of Thermodynamics) where belief is irrelevant, and the metaphysical world (e.g. the existence of an afterlife), where belief is all there is to the subject. I believe that most scientists admit to knowing only about 1% of all that is knowable (and that may be an over-estimation of the case). Therefore, anything outside that 1% could be true - it just can't be proved or disproved (as you say). Therefore, for anyone to say that there is absolutely no chance of something being possible (unless it can be demonstrated by science to be so) is to talk nonsense. Only when we know (if ever) 100% of all there is to be known, will we be able to make that pronouncemount. Why do I feel that I've merely repeated your point? Let's just say that I agree with it. Thanks Kid - I think you have more or less said the same as me, but in different words and approaching it from a different angle. I'm never sure with an abstract philosophical piece like this whether I'm getting my point across, so I really appreciate feedback like yours. Acceptance of science is also a belief. "Science" itself cannot be proven true by science. That would be like citing the Bible to prove that the Bible is true. Ross, 'science' simply means 'knowledge' - and knowledge comes from what is observable and what can be repeated under laboratory conditions. Therefore, your analogy doesn't quite withstand scrutiny. That's like saying that knowledge itself cannot be proven true by knowledge. However, if you mean that the belief that 'science' (as an umbrella title) can explain everything (when, as Andrew has pointed out, it can't), then I get your point. No, "science" doesn't simply mean "knowledge"; your statement that "knowledge comes from what is observable and what can be repeated under laboratory conditions" is the scientific theory or conception of knowledge, and not the only view of what constitutes "knowledge." Many think there are other routes to knowledge/knowing, and some dismiss sense-data as illusory. The methods of science cannot be used to "prove" that the scientific theory of knowledge is sound. The scientific theory of knowledge rests on philosophical axioms and presuppositions. The word has taken on different meanings over the years depending on whichever group is using it, but it springs from the word 'knowledge'. And while I'd agree that you can't use 'science' to prove every 'scientific' hypothesis (otherwise it would be fact), there are some aspects of science which can be used (as well as anything can) to 'prove' other aspects. If you're talking about 'divine revelation' type of 'knowledge' (and that sort of thing), then that's a whole different ball game which doesn't fall under the title of science. Nor does it really fall under the definition of knowledge, but rather that of belief. If I catch your drift. I'm not talking about specific hypotheses. Once the basic suppositions and methods of science have been called into question, those same suppositions and methods cannot be used to prove their own validity. You can't use scientific method to prove the validity of scientific method; that would not convince a non-believer in scientific method. Science ultimately rests on faith in the basic suppositions and methods of science. Divine revelation is not "knowledge" by your definition (or mine), but it obviously counts as knowledge to some. You say they're wrong? Well, that's your belief, not theirs. Once you've repeated such tests in different cases hundreds and thousands of times over and the tests are conclusive (as anything can be), then it's legitimate to assume that where such methods have worked in many instances, they're more than likely to work in others. Not in everything 'though, because in some cases they're just not applicable - as Andrew has pointed out if I understand him correctly. However, such discussions run the risk of creating heat not light, so let's just agree that both of us are 'not even wrong'. Yes, but if we don't BELIEVE in the reality of sense-data ("observations") then these observed patterns mean nothing. Get my drift? Do I believe in the reality of sense-data and the external world? Well, I encountered a rattlesnake (ingesting what looked like a rat) on the trail while hiking today, and I turned back, moving away from that snake PRONTO. Hahaha. Thanks Kid and Ross - it's nice to see such a lot of discussion, with some really well-made points. I think you are both basically in agreement with my original post -- that it's a fallacy to try and apply the scientific method to areas that are beyond the scope of science. While the word "science" does come from a root meaning "knowledge", there are many kinds of knowledge that are not scientific in the modern sense of the word. I'm not just talking about mysticism... for example a judge depends on knowledge of the Law to do his job, but it's not scientific knowledge. I said in an earlier comment that belief was "irrelevant" to science. What I meant was that the physical world is subject to laws that are true whether you believe in them or not (but I take Ross's point that this in itself is a "belief"). For example, I could tell someone that if they took a one-metre length of string, tied a small weight to the end, hung it from the ceiling and set it swinging back and forth, then one complete cycle is going to take about two seconds. They might not believe that (they may think the time would depend on the size of the weight, or the width of the swing)... but if they tried the experiment they would find it was true regardless of how much they disbelieved it. But Ross is right that this is still subject to an overarching belief in the scientific view of the world (that it obeys certain fixed laws, and that observations and measurements can't lie). I don't know if it's true in the real world, but in the kind of books I read Tibetan mystics are always talking about "mind over matter" and the illusory nature of the sensory world. If you take that view, then of course all bets are off. One final point regarding your above last paragraph, if I may, Andrew? Sure, it's a belief - but it's a belief based on observation and experience, not just a notion that comes from nowhere. Actually, I feel that Ross and I may have been talking at cross-purposes. If he was meaning that 'Science' in many ways, has now become like a 'religion' - in that people put their 'faith' in it and believe that it explains everything and can and will solve all problems (which it can't and won't) - then, as I previously said, I agree with him. However, the basic scientific method is still one that works in many cases. As you said 'though - it can't be applied to everything. No argument there, and I believe I did allude to that in my first response. Having said all that, what do I know? I'm not a scientist.